Next Parish Council meeting - 7.30pm on Tuesday 14 May 2019 at the Curridge W I Hall, Curridge Road, Curridge, Berkshire RG18 9DZ. Parish Council draft minutes will become available prior to a Parish Council meeting for members of the public to view. Draft Minutes. There is a vacancy for Chieveley Ward from 2 May 2019. Chieveley Parish Council is calling on residents, passionate about their community. There are only a few rules to stand for election. Email the Parish Clerk at chieveley.pc@btinternet.com for more information. Receiving a number of complaints from walkers, runners and dog walkers about the amount of dog fouling taking place along the local footpaths and byways. It is an offence to let your dog foul on a Public Right of Way. Please be responsible and clean up after your pet and dispose of it appropriately. There are dog waste bins located at the end of Bardown, Manor Lane and at Chieveley Recreational Centre, Chieveley. Also Chapel Lane and Crabtree Lane, Curridge. Thank you. 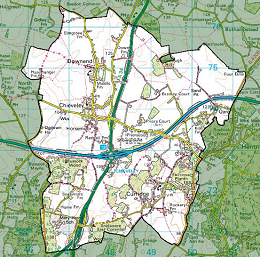 Two sites in Chieveley Parish have been included in the consultation. 60 Acre Field, Old Street, Chieveley (Page 12) and land behind Chieveley Services (page 21) adjacent to Old Kiln Quarry. This year is a Parish Council election year. New Parish Councillors will be elected on 2 May 2019.